Located overlooking 40 acres of vineyard land, the 3 suite Vineyard Villa has the best views of the Grand River Valley wine region. Relax on an individual outdoor deck just off the living room of your suite, or join others at the Vineyard Villa fire pit just steps away. This 600-square foot private suite is located on the second floor of our Vineyard Villa. Pinot Gris is one of the varietals you'll pass as you drive through our vineyard on your way to the Vineyard Villa. 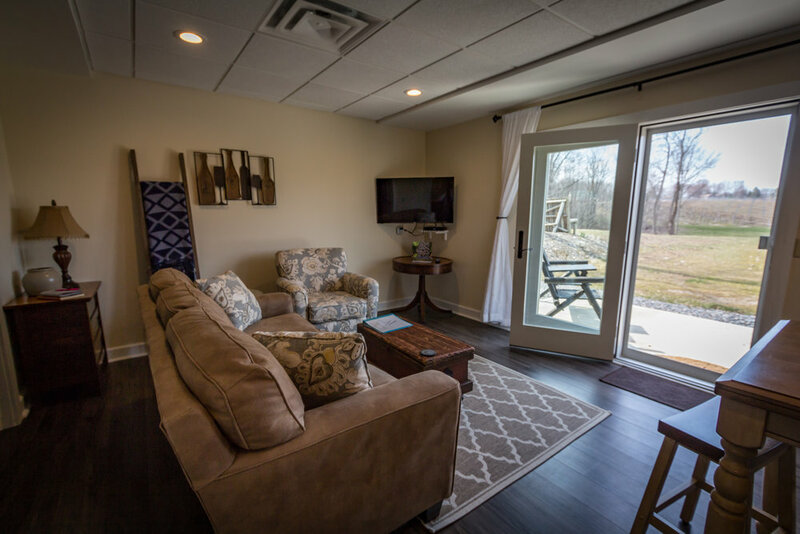 With large windows in the living room, you'll have have views of both the vineyards of the Grand River Valley wine region and woods on our property. It includes an in-suite bathroom with tile shower, kitchenette with refrigerator, and a wall mounted LED fireplace in the bedroom. You can relax inside or out, with an elevated deck off the living room. Located on the 2nd floor of the Vineyard Villa, this suite has a private deck that overlooks our Gewurztraminer vines at the highest point of our 10 acre vineyard. 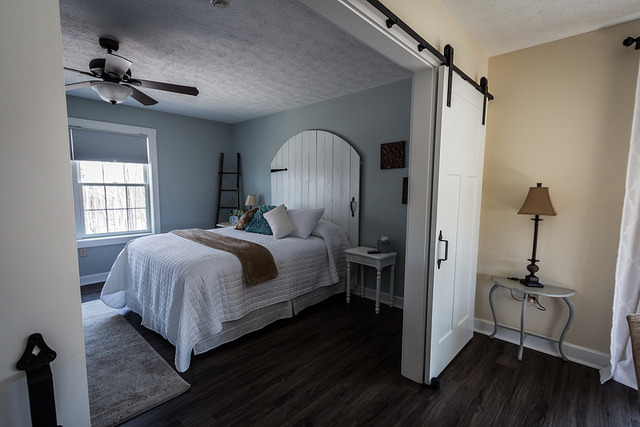 This 600-square foot suite features a cozy bedroom with a wall mounted LED fireplace, double barn doors that open to the living area, in-suite bathroom with tile shower, and kitchenette. Designed for two couples that are traveling together yet want ample space. This spacious 900 square-foot suite is located on the first floor of our Vineyard Villa. The 2 bedroom suite features a King bed and a queen bed, two LCD TV's, in-suite bathroom with tile shower, large living room area to unwind, and a kitchenette with full refrigerator. A private walk out patio overlooks neighboring Kosicek Vineyards. 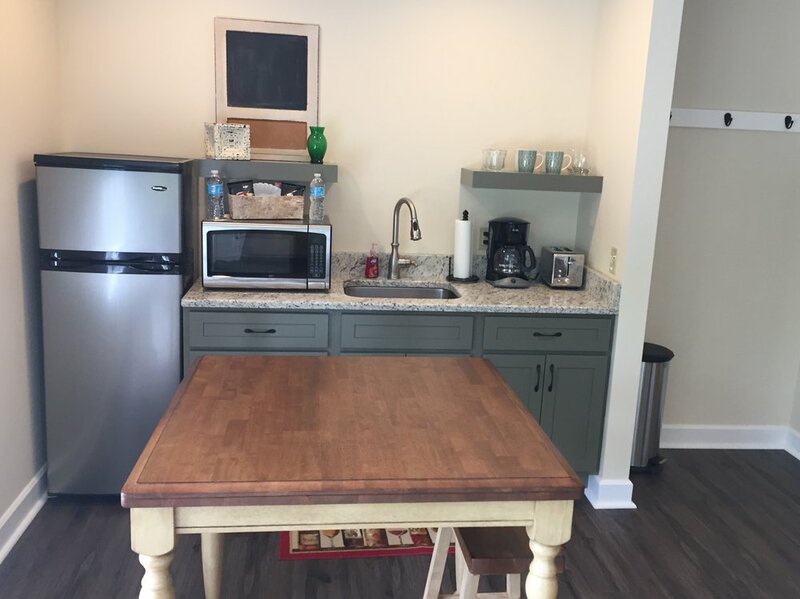 Ammenities availabe in all suites: LCD HDTV's with cable TV, complimentary wireless high-speed internet access, microwave, hair dryer, ironing board, coffee, shampoo, soaps, lotion, luxury linens and towels. All of our beds have Comphy brand sheets and pillow cases. The soft feel of the high-performance quality microfiber is comparable to 600 thread count sheets. Comphy is the leading provider of massage linens to the spa world, and now the benefits of the fabrics are available for your home. Buy Comphy products here.